Beer bike is really fun, but you’d better know that – firstly for your own good – there are some formal and informal rules towards fun being fun. In Western Europe the disadvantages of the beer bike were recognized in a surprisingly short time. Furthermore, in some cities it is forbidden. The situation is different here, in Budapest. There is no explicit decision yet about what transport asset can a beer bike be labeled as exactly. To save this sporty pleasure, be sure you know how to handle a beer bike on the streets of Budapest. Since beer bike is kind of heavy one, around 6-800 kgs, to move it needs at least 6 of you, and at most 12 – there are no more places on the bike. Back on the bench you can take a rest, and of course the one who draws the beer dones’t need to pedal. But the rest of you do, in order to reach the 6 km/h speed. It isn’t dangerous, the pedals go free, so your leg is safe. There is always a plus one person, the driver who goes with the beer bike. He is surely sober and surely cool at the same time. He controls the bike, and the team also, so be kind to him. If you are not in the mood, or especially on hen / stag parties, pick one of our pretty hostesses or good-looking hosts. In the end you have only two jobs: drink and pedal. And wondering at the ’sights’. You get with the beer bike at least 30 litres of chilly, fresh beer (or in wintertime mulled wine). In addition, you have the opportunity to order cider or champagne. This amount of drinks should be enough for the perfect mood, so you can, and should leave other beverages at the hostel room. Beer bikers care about you, and to keep you from falling off the bike, shots are taboos. For your safety, you can start the tour only, when you are not tipsy, drunk, stomped. Have the before on the beer bike, start the party with the cycling, and do the nasty stuff after! 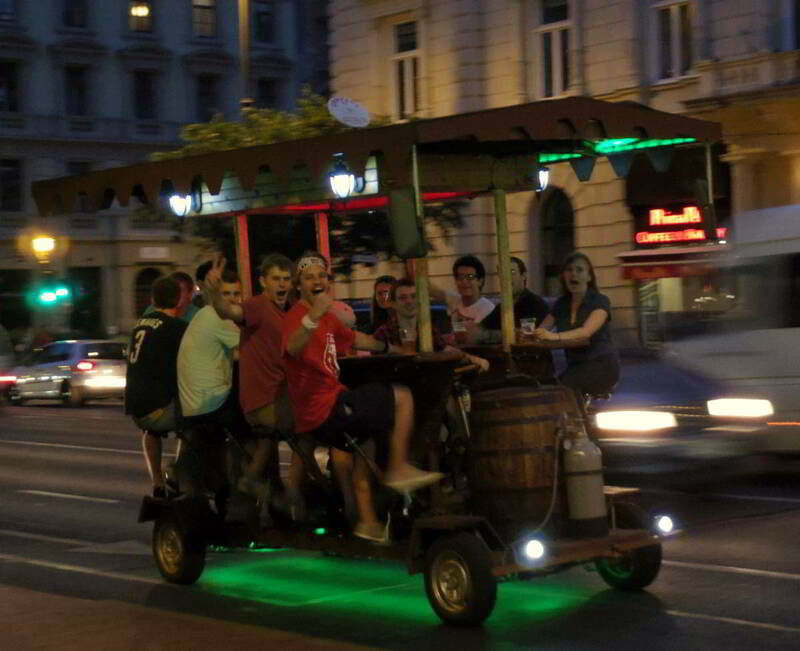 Beer bike is certainly one of the most flashy sights of Budapest, with you pedaling it! But there is no promise, that everybody will be in the same party mood on the street like you. Be polite, and don’t try to persuade them to have fun with you. They don’t even beer biking! But fun makes more fun, so feel free to share your happiness by singing - keep the volume at what you’d bear from your home. It is highly important to know that you can’t break the tour by yourself. By jumping off the bike, the driver will immediately turn back, and finish the tour. And you also have to pay a plus fee, so it isn’t worth it. If you feel any kind of need to stop, ask your driver. He knows where the toilet stops are anyway. 8. Your music is our music! We kept the good news to the end: the fun is guaranteed by biking together and drinking beer, but you have the opportunity to volume these with your music. Bring it on your smartphone or USB and you’ll listen to it during the route, thanks to the cool sound tech! You become a part of the traffic by beer biking, so you need to care about the others, but the fun still remains fun, and we do our best to keep you guys entertained!